Description: As we continue looking at Romans 12:1, we examine the ideas behind individual worship and what that might look like in the church. The reason many people today struggle with worship is related more to what they are willing to give than any various worship styles. Worship must always include a sacrifice and it starts with each of us willingly giving every part of ourselves to God and everything else that we do flows from there. If we struggle with giving, if we struggle with our prayer life, if we struggle with singing in worship, if we struggle with serving; the first place to examine is the altar of our heart and see what we have sacrificed. As we continue looking at Romans 12:1, we examine the ideas behind individual worship and what that might look like in the church. The reason many people today struggle with worship is related more to what they are willing to give than any various worship styles. 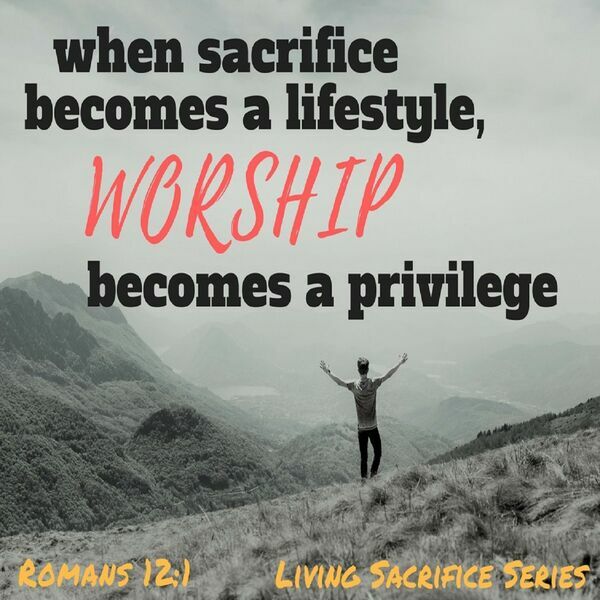 Worship must always include a sacrifice and it starts with each of us willingly giving every part of ourselves to God and everything else that we do flows from there. If we struggle with giving, if we struggle with our prayer life, if we struggle with singing in worship, if we struggle with serving; the first place to examine is the altar of our heart and see what we have sacrificed.